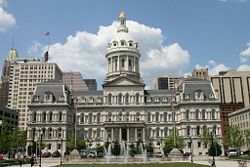 Baltimore is an independent city and the largest city in the state of Maryland in the United States. Baltimore is located in central Maryland at the head of the tidal portion of the Patapsco River, an arm of the Chesapeake Bay, and is approximately 40 miles (64 km) northeast of Washington, D.C.. Founded in 1729, Baltimore is a major U.S. seaport and is situated closer to major Midwestern markets than any other major seaport on the East Coast. Baltimore's harbor has always been a major asset. Once the second leading port of entry for immigrants to the United States and a major manufacturing center, today it is home to Harborplace and the National Aquarium in Baltimore and is a successful example of Baltimore's ambitious efforts at renewal. Following the fall of many of its largest manufacturing industries, Baltimore has shifted primarily to a service sector-oriented economy, with the largest employer no longer Bethlehem Steel but Johns Hopkins University and Johns Hopkins Hospital. Despite some successful revitalization, Baltimore is still posed with many big-city challenges such as concentrated poverty and crime, and inadequate public education. As of 2007, the population of Baltimore City was 637,455. The Baltimore Metropolitan Area, which includes the city's surrounding suburbs, has approximately 2.6 million residents; it is the twentieth largest in the country. Baltimore is also the largest city in the Baltimore-Washington Metropolitan Area of approximately 8.1 million residents. Because there is also a Baltimore County nearly surrounding (but not including) the city, it is sometimes referred to as Baltimore City when a clear distinction is desired. The city is named after Cecilius Calvert, 2nd Baron Baltimore, 2nd Lord Baltimore of the Irish House of Lords, the founding proprietor of the Maryland Colony. Lord Baltimore himself took his title from a place named Baltimore, Ireland. Baltimore is in north-central Maryland on the Patapsco River close to where it empties into the Chesapeake Bay. The city is also located on the fall line between the Piedmont Plateau and the Atlantic Coastal Plain. The city's elevation ranges from sea level at the harbor to 480 feet (150 m) in the northwest corner near Pimlico. The city has a total area of 92.1 square miles (238.5 km²). Baltimore lies within the north temperate climate zone. July is typically the hottest month of the year, with an average high temperature of 91°F (32°C). Summer is also a season of very high humidity in the Baltimore area, with afternoon thunderstorms occurring regularly. January is the coldest month, with an average high of 44°F (6°C) and an average low of 29°F (-1°C). As is typical in most East Coast cities, precipitation is generous, and very evenly spread throughout the year. Every month usually brings 3-4 inches of precipitation, averaging around 43 inches (1,100 mm) annually. Some light to moderate snowfall can occur in the winter, with heavy snows relatively rare. The city lies between two peculiar physical features that protect it from extreme weather and account for the relatively tempered seasons. The Appalachian Mountains protect central Maryland from much of the harsh northern winds and accompanying lake effect weather that bring subfreezing temperatures and heavy snows to the Great Lakes region, and the Delmarva Peninsula protects Baltimore from many of the tropical storms that affect the coast. The streets are lined with tens of thousands of brick and Formstone faced rowhouses. Many consider the rowhouse the architectural form most closely associated to the city. Some rowhouses are dated as far back as the 1790s. Oriole Park at Camden Yards is considered by many to be the most beautiful baseball park in Major League Baseball, and has inspired many other cities to build their own versions of this Retro-Style ballpark. Camden Yards along with the National Aquarium have helped revive the Inner Harbor from what once was an industrial district full of dilapidated warehouses into a bustling commercial district full of bars, restaurants, and retail establishments. Baltimore is officially divided into nine geographical regions: Northern, Northwestern, Northeastern, Western, Central, Eastern, Southern, Southwestern, and Southeastern. However, it is not uncommon for locals to divide the city simply as East or West Baltimore, using Charles Street or I-83 as a dividing line, and/or into North and South using Baltimore Street as a dividing line. 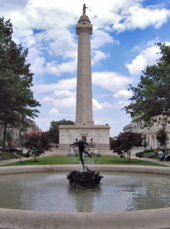 Battle Monument commemorates the War of 1812 Battle of Baltimore. Sixth Regiment fighting railroad strikers, July 20, 1877. Great Baltimore Fire of 1904, looking West from Pratt and Gay Streets. The Maryland colonial General Assembly created the Port of Baltimore at Locust Point in 1706 for the tobacco trade. The Town of Baltimore was founded on July 30, 1729. Baltimore grew swiftly in the eighteenth century as a granary for sugar-producing colonies in the Caribbean. The profit from sugar encouraged the cultivation of cane. Baltimore's shorter distance from the Caribbean, compared to other large port cities such as New York City and Boston, reduced transportation time and minimized the spoilage of flour. Baltimore played a key role in events leading to and during the American Revolution. City leaders moved the city to join the resistance to British taxes and merchants signed agreements to not trade with Britain. After the war, the Town of Baltimore, nearby Jonestown, and an area known as Fells Point were incorporated as the City of Baltimore in 1797. The city remained a part of Baltimore County until 1851 when it was made an independent city. 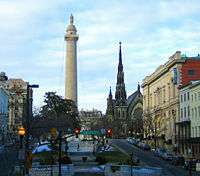 The city was the site of the Battle of Baltimore during the War of 1812. After burning Washington, D.C., the British attacked Baltimore on the night of September 13, 1814. United State forces from Fort McHenry successfully defended the city's harbor from the British. Francis Scott Key, a lawyer, was aboard a British ship where he had been negotiating for the release of an American prisoner. Key witnessed the bombardment from this ship and later wrote "The Star-Spangled Banner," a poem recounting the attack. Key's poem was set to a 1780 tune by British composer John Stafford Smith, and the "Star-Spangled Banner" became the official national anthem of the United States in 1931. In the years after the war, the city's population grew rapidly. The construction of the federally funded National Road (presently U.S. Route 40) and the private Baltimore & Ohio Railroad (B&O) made Baltimore a major shipping and manufacturing center by linking the city with major markets in the Midwest. Maryland did not secede during the Civil War. When Union soldiers marched through the city at the start of the war, Confederate sympathizers attacked the troops, which led to the Baltimore riot of 1861. Four soldiers and 12 civilians were killed during the riot, which caused Union troops to occupy Baltimore. Maryland came under direct federal administration—in part, to prevent the state from seceding—until the end of the war in April 1865. On February 7, 1904, the Great Baltimore Fire destroyed over 1,500 buildings in 30 hours and forced most of the city to rebuild. The city grew in area by annexing new suburbs from the surrounding counties. A riot occurred in the city following the assassination of Martin Luther King, Jr. in Memphis, Tennessee, on April 4, 1968, coinciding with riots in other cities. The riot cost the city an estimated $10 million (about $63 million in 2008 dollars). Lasting effects of the riot can be seen on some streets, where long stretches remain barren. During the 1970s, Baltimore's downtown area, known as the Inner Harbor, had been neglected and was only occupied by a collection of abandoned warehouses. Efforts to redevelop the area began with the construction of the Baltimore Convention Center, which opened in 1979. Harborplace, an urban retail and restaurant complex, opened on the waterfront in 1980, followed by the National Aquarium—Maryland's largest tourist destination—in 1981. In 1992, the Baltimore Orioles baseball team moved to Oriole Park at Camden Yards, located downtown near the harbor. Six years later the Baltimore Ravens football team moved into M&T Bank Stadium next to Camden Yards. On January 17, 2007, Sheila Dixon became the first female mayor of Baltimore. Baltimore is an independent city—not part of any county. For most governmental purposes under Maryland law, Baltimore City is treated as a "county"-level entity. Baltimore has been a Democratic stronghold for over 150 years, with Democrats dominating every level of government. On November 6, 2007, incumbent Democratic Mayor Sheila Dixon was elected mayor. Dixon, as former City Council president, had assumed the office on January 17, 2007, when former Mayor Martin O'Malley took office as the governor of Maryland. Grassroots pressure for reform restructured the city council in November 2002, against the will of the mayor, the council president, and the majority of the council. A coalition of union and community groups backed the effort. The council is now made up of 14 single-member districts and one elected at-large council president. Prior to 1969, some considered Baltimore and its suburbs to be underrepresented in the Maryland General Assembly, while rural areas were heavily overrepresented. Since the court decision in Baker v. Carr in 1962, Baltimore and its suburbs account for a substantial majority of seats in the state legislature; this has caused some to argue that rural areas are now underrepresented. Baltimore's steady loss of population, however, has resulted in a loss of seats in the Maryland General Assembly. Since 1980, Baltimore has lost four senators from the 47-member Maryland State Senate and 12 delegates from the 141-member Maryland House of Delegates. Three of the state's eight congressional districts include portions of Baltimore. All three seats are held by Democrats; a Republican has not represented a significant portion of Baltimore since 1931 and has not represented any of Baltimore since 2003. Once an industrial town, with an economic base focused on steel processing, shipping, auto manufacturing, and transportation, Baltimore now has a modern service economy. Although de-industrialization took its toll on the city, costing residents tens of thousands of low-skilled, high-wage jobs, the city is a growing financial, business, and health service base for the southern Mid-Atlantic region. The city is also home to Johns Hopkins Hospital, which will serve as the center of a new biotechnology park, one of two such projects under construction in the city in 2008.. The port was founded in 1706, preceding the founding of the city. The Maryland colonial legislature made the area near Locust Point the port of entry for the tobacco trade with England. Fells Point, the deepest point in the natural harbor, soon became the colony's main ship building center and later became a leader in the construction of clipper ships. The California Gold Rush led to many orders for fast vessels; many overland pioneers relied upon canned goods from Baltimore. At the end of the nineteenth century, European ship lines had terminals for immigrants. The Baltimore and Ohio Railroad made the port a major transshipment point. Currently the port has major roll-on roll-off facilities, as well as bulk facilities, especially for steel handling. In 2007, Duke Realty Corporation began a development near the Port of Baltimore, named the Chesapeake Commerce Center. This new industrial park is located on the site of a former General Motors plant. The total project comprises 184 acres (0.74 km²) in eastern Baltimore City and the site will yield 2,800,000 square feet (260,000 m²) of warehouse/distribution and office space. Chesapeake Commerce Center has direct access to two major Interstate Highways (I-95 and I-895) and is located adjacent to two of the major Port of Baltimore Terminals. Two tunnels traverse the Baltimore harbor within the city limits: the four-bore Fort McHenry Tunnel (served by I-95) and the two-bore Harbor Tunnel (served by I-895). The Baltimore Beltway crosses south of Baltimore harbor over the Francis Scott Key Bridge. Baltimore is a top destination for Amtrak along the Northeast Corridor. Baltimore's Penn Station is one of the busiest in the country. Additionally, the MARC commuter rail service connects the city's two main intercity rail stations, Camden Station and Penn Station, with Washington, D.C.'s Union Station as well as stops in between. Public transit in Baltimore is provided by the Maryland Transit Administration. The city has a comprehensive bus network, a small light rail network connecting Hunt Valley in the north to the airport in the south, and a subway line between Owings Mills and Johns Hopkins Hospital. Baltimore is served by Baltimore-Washington International Thurgood Marshall Airport, generally known as "BWI," which lies to the south in neighboring Anne Arundel County. In terms of passengers, BWI airport is the twenty-sixth top airport in the United States. 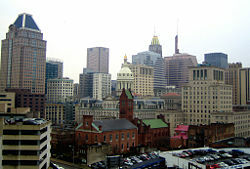 Baltimore was among the top 10 cities in population in the United States in every census up to the 1980 census, and after World War II had a population of nearly a million. The city and metropolitan area currently rank in the top 20 in terms of population. In the 1990s, the Unites States census reported that Baltimore ranked as one of the largest population losers alongside Detroit, Michigan and Washington, D.C., losing over 84,000 residents between 1990 and 2000. As of 2006, the population was 637,455. The Baltimore–Towson metropolitan area, as of 2004, was estimated to have a population of 2.6 million. The population density was 8,058.4 people per square mile (3,111.5/km²). There were 300,477 housing units at an average density of 3,718.6/sq mi (1,435.8/km²). The racial makeup of the city was 64.85 percent African American, 31.28 percent Caucasian, 0.32 percent Native American, 1.53 percent Asian, 0.03 percent Pacific Islander, 0.67 percent from other races, and 1.47 percent from two or more races. 1.70 percent of the population were Hispanic or Latino of any race. This census, however, does not accurately represent the city's Latino population, which has been steadily increasing in recent decades. 6.2 percent of the population were of German ancestry, according to the 2000 census. About 18.8 percent of families and 22.9 percent of the population were below the poverty line, including 30.6 percent of those under age 18 and 18.0 percent of those ages 65 or over. According to crime statistics there were 276 homicides in Baltimore in 2006, the second-highest homicide rate per 100,000 of all United States cities of 250,000 or more population. Though this is significantly lower than the record-high 353 homicides in 1993, the homicide rate in Baltimore is nearly seven times the national rate, six times the rate of New York City, and three times the rate of Los Angeles. Other categories of crime in Baltimore have also been declining, although overall crime rates are still high compared to the national average. The rate of forcible rapes has fallen below the national average in recent years; however, Baltimore still has much higher-than-average rates of aggravated assault, burglary, robbery, and theft. Baltimore was ranked as the twelfth most dangerous city in the United States in 2008. City officials have, however, come under scrutiny from Maryland legislators regarding the veracity of crime statistics reported by the Baltimore City Police Department. In 2003, the FBI identified irregularities in the number of rapes reported. The number of homicides in 2005 appeared to exhibit discrepancies as well. However, many of the charges made by the police commission now appear to be politically motivated. Under the administration of Mayor Sheila Dixon and a new police commissioner, crime rates have been reduced, including a 40 percent fall in the number of murders as of April 2008. As of December 3, 2008, the city had had 216 homicides. The Baltimore City Public School System in in charge of the education of approximately 90,000 children. It maintains about 173 schools, including Baltimore City College, the third oldest public high school in the country, and Western High School, the oldest public all-girls school in the nation. Partial control was ceded to the state in exchange for increased funding. The mayor and governor jointly appoint the school board that oversees the system. Baltimore is the home of numerous places of higher learning, both public and private. Among the private schools are Johns Hopkins University, College of Notre Dame of Maryland, and Loyola College in Maryland. The public colleges include Baltimore City Community College, Coppin State University, Morgan State University, University of Baltimore, and University of Maryland, Baltimore. Historically a working-class port town, Baltimore has sometimes been dubbed a "city of neighborhoods," with over 300 districts traditionally occupied by distinct ethnic groups. Most notable today are three downtown areas: the Inner Harbor, frequented by tourists due to its hotels, shops, and museums; Fells Point, once a favorite entertainment spot for sailors but now refurbished and gentrified; and Little Italy, located between the other two, where Baltimore's Italian-American community was based. Further inland, Mt. Vernon is the traditional center of cultural and artistic life of the city; it is home to a distinctive Washington Monument, set atop a hill in a nineteenth-century urban square, that predates the more well-known monument in Washington, D.C., by several decades. As Baltimore's demographics have changed since World War II, its cultural flavor and accents have evolved as well. Today, after decades of out-migration to suburbs beyond its corporate limits and significant in-migration of African Americans from Georgia and the Carolinas, Baltimore has become a majority black city with a significantly changed, but still regionally distinctive, dialect and culture. Recently, neighborhoods such as Federal Hill and Canton have undergone extensive gentrification and have proven to be popular places for young professionals and college students to reside. In addition, Latinos are making their mark, notably in Upper Fells Point. Baltimore has been home to a successful black middle class and professional community for centuries. Before the Civil War, Baltimore had one of the largest concentrations of free black Americans among American cities. In the twentieth century, Baltimore-born Thurgood Marshall became the first black American justice of the U.S. Supreme Court. The Baltimore Symphony Orchestra is an internationally renowned orchestra, founded in 1916. Center Stage is the premier theater company in the city and is regionally well respected. The Baltimore Opera is an important regional opera company, and The Baltimore Consort has been a leading early music ensemble for over 25 years. The France-Merrick Performing Arts Center, home of the restored Hippodrome Theatre, has afforded Baltimore the opportunity to become a major regional player in the area of touring Broadway and other performing arts presentations. The Baltimore Orioles have represented Major League Baseball locally since 1954, when the St. Louis Browns moved to Baltimore. The Orioles won three World Series Championships in 1966, 1970, and 1983. In 1995, Cal Ripken, Jr. broke Lou Gehrig's "unbreakable" streak of 2,130 consecutive games played. Six former Orioles players have been inducted into the Baseball Hall of Fame. The Baltimore Ravens have represented the National Football League since 1996. The team has had great success, including a Super Bowl Championship in 2001 and two division championships (2003 and 2006). 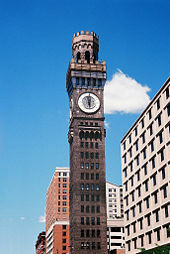 Bromo Seltzer Tower, erected in 1911. Baltimore City College, a public college-preparatory magnet school in Baltimore, the third oldest public high school in the United States. In late 2003, the public school system was discovered to be in a severe fiscal crisis, with a deficit estimated to be anywhere from $54 to $64 million. As a means of reducing the gap, extensive layoffs of teachers and staff took place and new controls were enacted to ensure that spending was more closely monitored. Funding is not the only criterion by which to measure the quality of education provided, but the Baltimore City Public School System is often cited as one of the most under-funded school systems in the state, ranked as twenty-first in overall spending, after falling from fourth approximately 20 years ago. Although economics in Maryland may be an obstacle, alternative approaches and similar initiatives may prove effective. Some neighborhoods were renovated in the late twentieth and twenty-first centuries and attracted new residents. Other parts of the city languished. East Baltimore contains some of the city's most impoverished neighborhoods. In 2008, the city had 30,000 abandoned properties. The city's Comprehensive Master Plan aims to capture and encourage biotech job opportunities, create larger tracts of land for commercial or industrial development near transportation centers, and connect residents to available employment. Currently the health, medical, financial, and construction sectors are large and growing. Tourism has long been a strong industry. The City of Baltimore Development Corporation (BDC) is a 501(c)(3) corporation that contracted with the City of Baltimore to provide economic development services. BDC's goal is to keep existing employers and attract new opportunities. Their work with businesses aims at shepherding private development projects through public processes. BDC facilitates the reuse of publicly owned property for new and expanding businesses. The 2007 Homeless Census reported that on any given night, at least 3,000 Baltimore city residents sleep on the streets, in shelters, in cars, or other locations. The census found that 1,000 Baltimore citizens meet the federal definition of "chronically homeless," meaning they have been homeless for more than one year or have had at least four episodes of homelessness in three years. To address some of the causes—such as lack of affordable housing, and lack of affordable health care, Baltimore Homeless Services is implemented a 10-year plan to end homelessness by 2018. Baltimore's Inner Harbor, seen from Federal Hill. A nighttime panorama of Baltimore's Inner Harbor. ↑ USGS detail on Baltimore. Retrieved 2008-12-30. ↑ US Census Bureau. Annual Estimates of the Population of Metropolitan and Micropolitan Statistical Areas: 2007 Retrieved December 30, 2008. ↑ US Census Bureau, Population Finder Baltimore city, Maryland Retrieved December 30, 2008. ↑ Pearson Education; Infoplease. Top 50 Cities in the U.S. by Population and Rank. Retrieved December 30, 2008. ↑ US Census Bureau. Baltimore city, Maryland Retrieved December 30, 2008. ↑ U.S. Department of Justice. Offenses Known to Law Enforcement by State by City, 2006 Retrieved December 30, 2008. ↑ Area Connect. Baltimore Maryland Crime Statistics and Data Resources Retrieved December 30, 2008. ↑ WBAL-TV. March 12, 2008. Baltimore's Murder Rate Retrieved December 30, 2008. This page was last modified on 10 May 2016, at 16:42.